Summer college visits aren’t such a great idea. 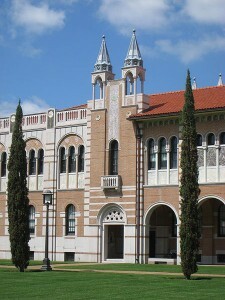 Do you see many students in this photo of Rice University? We didn’t think so. With summer approaching, you’d think it would be the perfect time to go and visit colleges. Students have a couple of months off from school. Their schedules are emptier. They’ve got the time and the weather is nice! But summer college visits are not a great idea. A number of folks in the college admissions community recommend visiting colleges over the summer. They think it’s an opportune time to check out schools. But they’re wrong. Don’t listen to them. And why’s that? Because, at most universities across this nation, college students aren’t on campus during the summer. Are there exceptions to this rule? Yes. For instance, sophomores at Dartmouth College spend their summers at the College on the Hill, taking classes and going off the rope-swing into the Connecticut River (when the administration isn’t busy taking it down). But overwhelmingly, most college students are not on campus during the summer months. And when you visit colleges, it’s important to get a sense of the kinds of students who attend each school. What if you were to like the weather at a school over the summer when the campus was devoid of students, only to enroll the following year and realize that every student at the school has purple hair? What if you don’t like jocks and you realize when you enroll that the school is full of jocks? You can’t get a sense of the student body during summer college visits. It’s just not possible (except at a couple of colleges). You can’t ask students questions. You can’t see if students are smiling, if they’re happy. You can’t walk inside a dormitory and chat with first-year students. You can’t do any of this. Because they just aren’t there over the summer. So visit in the fall, winter, or spring of your junior year of high school. Visit in the fall if you still haven’t made up your mind. But summer visits — they are, in many ways, a waste. In spite of what others in the college admissions community might say to the contrary!